Unibroue | Beer Apprentice - Craft Beer News, Reviews, Interviews and Info. Hi guys. For today’s craft beer review I’m going to be trying the Unibroue La Terrible produced by the Unibroue Brewery located in Chambly, Quebec, Canada. It’s been sometime since I last had a brew from Unibroue and I’ve yet to try this one, so I’m looking forward to it. From the website, unibroue.com, not a whole lot was provided about the beer. However, I jumped over to ratebeer.com and found this. The La Terrible came in a 25.4 oz. bottle and it had an ABV of 10.5%. It poured a deep burgundy color with some rich, ruby highlights showing around the curves of the chalice. The crown was light tan and sized well. It was smooth and just a touch fizzy. The retention time was ok and the lacing seemed to be only average. A ton of sticky alcohol was left clinging to the sides when tilted and swirled however. The nose was quite sweet smelling. Sweet fragrances of fruit. Tones of apple juice, ripe grapes and plum. Bountiful amounts of Belgian yeast type aromas, spices of clove as well as some light touches of caramel malt really helped pull some of the sweetness off the top to create a very well balanced, harmonized and complex aroma. Nary a hint of alcohol was detected within the bouquet. The flavor also released a solid shot of apple accompanied by savors of raisin and grape. A tone of dark rye bread and yeast intermingled with the clove to give it an earthy and round tone that I really liked. Some of that caramel was again found, yet only after it warmed a touch. Like the aroma, it started sweet, but settled gently as it opened up. Nice. I’ll say though, that the alcohol was easily noticed, yet it never seemed to overpower or dominate the taste. The mouthfeel was medium bodied. Rather smooth, dry and chewy. The carbonation was of medium strength. A nice shot of warmth was felt and a heap of flavor was left behind on the palate after each sip. In conclusion, I thought this was a very, very nice beer. One of the better ones from Unibroue in my opinion. I’d suggest you guys pick it up if you get the chance. It was complex, rich, bold, flavorful and solid in all aspects. The drinkability was reasonable too. Especially considering that it’s classified as a Belgian Strong Dark Ale with an ABV of 10.5%!!!! I still sipped though. I believe that it would be a great accompaniment to a cold Winter’s eve for sure. 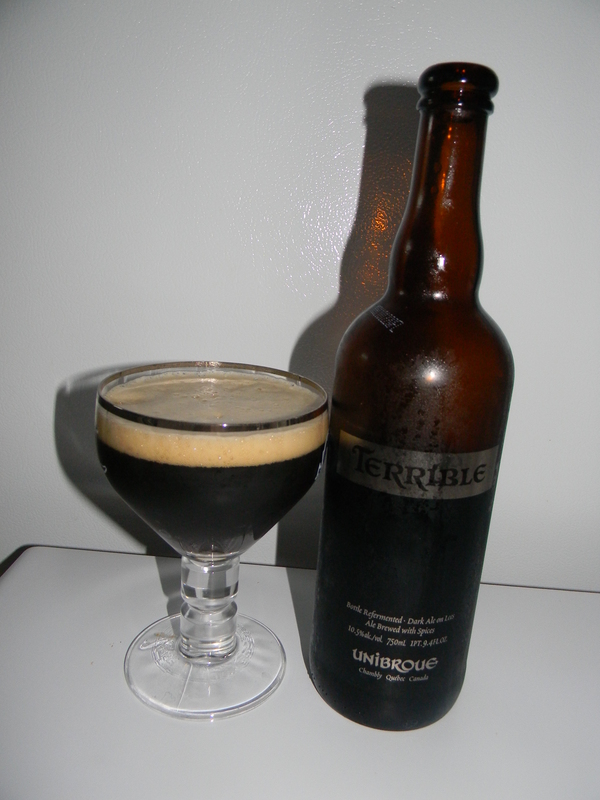 Have you guys ever tried the Unibroue La Terrible? If so, what did you think of it? Please, leave a comment and tell me of your experience if you’d like. How’s it going everyone? Well I hope. Thanks for checking back in on another craft beer review. Today, I’m going to be trying the Unibroue Grand Reserve 17 (2011) produced by the Unibroue Brewery located in Chambly, Quebec, Canada. I’ve been looking for this brew for awhile now and when I finally saw it the other day I had to pick it up and give it a go. From the website, unibroue.com, we find this bit of info. As testimony to it’s remarkable flair profile which increases in complexity as it ages, the original batch bottled in 2007 was awarded an international platinum medal three years in a row, and the prestigious title of “World’s Best Dark Ale” when it was well past three years in the bottle! So in 2011, we proudly brought back this French Oak aged, bottle refermented dark ale, with the “Grande Réserve” appellation as a fitting endorsement of it’s exceptional quality for aging. Brewed only once a year, in limited quantities, and individually numbered “brasseur” bottles, this is truly a flavorful delight for the specialty beer enthusiast. Let’s get this baby poured. Bottle #96311. This brew has an ABV of 10.0% and it comes in a 25.4 oz. bottle. It poured a dark burgundy color with a few shimmers of ruby outlined along the edges. It formed a full, kind of soapy and fizzy, khaki colored head. It maintained its size very well and it produced some very nice lacing as it subsided back into the liquid. The bouquet presented some sugar with touches of overripe banana and spicy clove. A hint or two of bittersweet chocolate and raisin added some depth whilst a light whiff of Belgian yeast revealed itself after a moment. A very minor, subdued aroma of wood was found buried deep within. All in all, quite restrained, but very, very well balanced, harmonized and pleasing. The taste let those dark fruits jump out a lot more and they become more refined and defined. Raisins, dates and figs were all found. More Belgian yeast too. Very, very nice I must say. The banana savors all but disappeared and the chocolate became more of a complimentary flavor also. The spicy clove and even a bit of peppery bite meshed well with the overall profile. The woodiness, like in the smell, was mild and favorable and helped “round” everything off. A beautiful taste with this beer in my opinion. The mouthfeel was medium bodied. Quite smooth, dry, chewy and slick. The carbonation was about perfect and a bit of heat was generated from the 10.0% ABV. A very nice drenching of flavor was left behind on the palate after the swallow as well. Well. 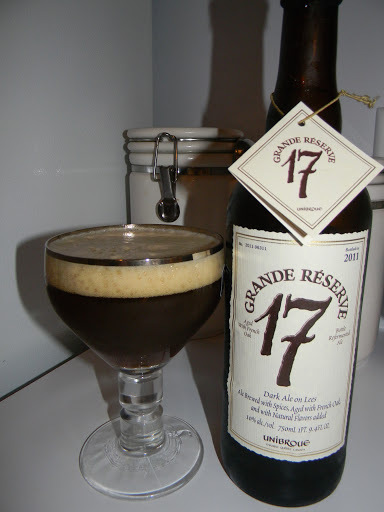 Unibroue has produced a very nice beer with the Grand Reserve 17. I’m so glad I got to try it. Granted the nose was a bit gentle, however the appearance, flavor, mouthfeel and drinkability made up for it. I think this brew is definitely worth a try if you can find a bottle. I should have picked up two!!! Oh well, too late now I guess. I could easily see myself sitting with this on a cool night while reading a book or jamming out on the guitar. Did you guys get the chance to try it? What did you think? Leave a comment and tell me your opinion if you’d like. Hello again. For today’s craft beer review I’m going to be tasting the La Fin Du Monde produced by the Unibroue Brewery located in Chambly, Quebec, Canada. It’s been awhile since I last tried this brew, but I have always enjoyed it when given the opportunity to partake. Let’s jump to quite possibly my favorite “brewery” website, unibroue.com, and find out what they say about the La Fin Du Monde. This brew comes in a 25.4 oz. bottle and it has an ABV of 9.0%. The La Fin Du Monde poured a cloudy, yellow/gold color. It produced a bright white head that was not of great size. It was quite fizzy and sudsy. The retention time was slight and the lacing left a little to be desired, but the color does look very nice I must say. The nose brought out hints of white grapes. They were combined with an exquisite dose of spices ranging the gamut of pepper, cloves and coriander. It was also rather yeasty and bready with undertones of wheat. I found it to be very well balanced and even throughout the drinking experience. Within the taste, the spices stepped it up a notch. The pepper, coriander and cloves really pushed forward and delighted the tongue with a good “sting”. The white grapes were accounted for again, but I also noticed a touch of alcohol coming out as the liquid passed across the palate. The bitterness was mild due to the yeasty and bready components becoming more evident and round as the brew warmed to room temperature. I thought this was an overall pleasing and excellent flavor. The mouthfeel was a sturdy medium. It was mostly smooth, dry, crisp and somewhat refreshing. The carbonation was good and a solid amount of heat was generated from both the alcohol and the peppery spice. A commendable amount of flavor was left covering the tongue and roof of the mouth for a good while after each sip too. 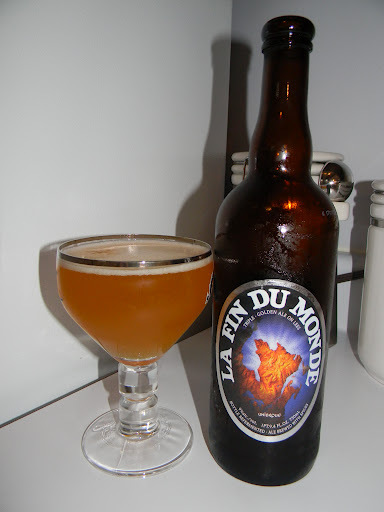 The Unibroue La Fin Du Monde is a solid, solid beer to say the least. It’s a “staple” in my book. A beer that I think should be tried by all craft beer enthusiasts. It’s a brew that can be enjoyed at anytime of year in my opinion. It’s one of those beers that, when chosen, is never a bad decision. The aroma and flavor carry enough “oomph” to satisfy. Not to mention the ease of drinkability that it possesses. In conclusion, if you have never tried the La Fin Du Monde, or if it’s been a while since you last did so, don’t hesitate to pick up a bottle the next time you see it. I think that you will be satisfied by the outcome. I would love to hear some feedback from you guys. Do you like the reviews? Do you think I should continue? I can handle the criticism I promise. Good, bad or otherwise. I want to make this site the best it can be.